The 12th annual Rondo Award nominations have been officially announced and I'm honored to report that I've been nominated for FOUR Rondos! 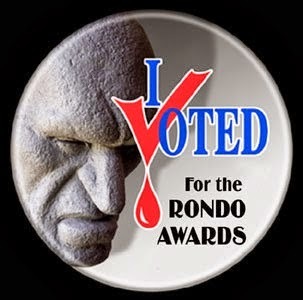 The Rondo Awards are an annual award for classic horror excellence. Spearheaded by David Colton, they are named after classic Universal actor Rondo Hatton. To be eligible for this year's ballot the work had to have come out in 2013. Category 13. BEST ARTICLE (Please select two; one will win)– ‘Credit Where Credit Is Due: - Jack Pierce: Frankendesigner,’ by Dr. Gangrene, SCARY MONSTERS #85. A detailed refutation of the argument that James Whale was the designer of the Monster’s look. To vote, email your selections to taraco@aol.com by Sunday May 5 - and be sure to include your name in the email for your vote to count!